Hardboot construction is based on hard shell made out of rigid material. Shell’s characteristics vary between models and brands, however, such skates are always relatively stiff and tough. Thanks to this, the boot provides great ankle support and protects feet from damage – it can also withstand a lot of abuse. 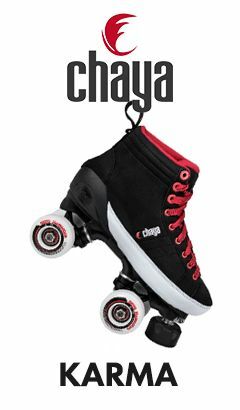 Such skates are perfect for aggressive, freeskating, downill and every other skating activity, where safety and reliability matters. In addition, when equipped with short frame, such skates are great entry point in to the world of freestyle slalom. Removable liner – liner is a type of a soft, sock-like boot that can be taken out of the shell and cleaned separately. It is possible to replace stock liner with different model, to get better fit or adjust the skate to your personal preferences. Ability to replace worn down liner also gives the skates more longevity, as you can breathe a new life in to your old pair by replacing this part. Composite shell is made of molecular composite (hence the name) of two or more plastic compounds. It can be reinforced with addition of glass fibres for additional rigidity. Characteristics of such boot depend on used materials, their thickness and density, however it can be stated that such skates, made by renowned manufacturers, offer excellent support and protection for user’s joints and feet, while being able to withstand a lot of abuse. It is worth to keep in mind that materials used to make the shell are usually thermoplastic, so if the rest of the boot (glue, leather, foams and so on) can withstand higher temperatures, boots are suitable for heat moulding. Screwed on cuff – cuff is attached by screws, which makes replacing the part easier. Skates are equipped with classic laces. 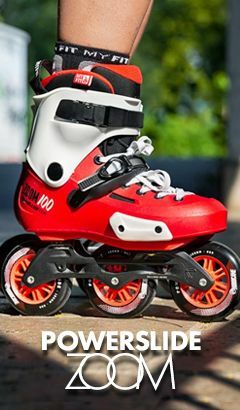 45° ratchet – skates are equipped with ratchet buckle, sometimes called „pump”. It allows for precise adjustment of tightening, locking heel in place. The buckle is attached to plastic straps with additional protection, which secures mechanism from getting damaged during the falls. Cuff buckle – traditional buckle with receiver. The cuff is shaped in a way that allows excess of a strap to be hidden in a hole, which makes skating safer. Buckle allows firm tightening of a top of the skate, which stabilizes your ankle. Heatmoldable liner – liner is made out of heatmoldable materials, which acquire plasticity while heated to temperature below 100 °C. This allows you to adjust it to your anatomy, gives superior comfort and can eliminate unwanted pressure points. Flat setup frame – all wheels in the frame are on the same level and touch the ground simultaneously. This provides superior stability, greater rolling, more inertia and reduces wheels wear. It is, however, much harder to do groove tricks on aggressive frames using this wheel setup. Round wheel profile – wheels have round profile, which is midway between flat and bullet one. They are relatively stable and grip well, all the while maintaining good rolling and reasonable speed during skating. They are perfect for anyone who values versatility.